Those in the market for a handsome and capable family wagon could do a lot worse than the critically acclaimed S-Max. With it, Ford has managed to cram a large amount of style and performance into a vehicle sector that was once feared and often loathed by any new parent – the dreaded people carrier. Now, the Blue Oval has decided to give the S-Max a premium makeover by applying the marque's upcoming Vignale moniker. Keen readers will know that the Mondeo underwent similar treatment last year, gaining improved materials inside, larger alloys and exterior tweaks that allow it to take on the likes of BMW and Mercedes. 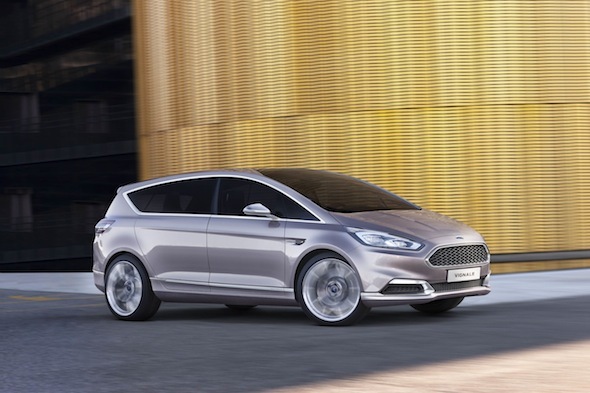 The luxurious S-Max was unveiled in Milan this week and reiterates Ford's intentions to march upmarket by blending premium materials with the sort of expert craftsmanship found in luxury models. Heading up the stylistic tweaks is a set of bespoke 21-inch Vignale alloy wheels, 'jewellery-like appliques' and chrome mirror caps and a new hexagonal grille that will feature on all upcoming Vignale models. Like the Mondeo concept of last year, the interior is treated to swathes of leather, which extend from the dashboard to the luggage compartment, and aluminium highlights - that are said to take inspiration from menswear fashion trends and high-end furniture design – grace dials, handles and switches. Technology also plays a major part in much of Ford's upcoming model onslaught and the S-Max Vignale is no different, featuring advanced car-to-car communications, tablet device-docking stations for second row seats and an intelligent flexible seating concept with 'thin seat' technology, which enables the seats to be raised and lowered in a single action with minimum effort. "We know that many customers are looking for a Ford that's more exclusive and upscale than we currently offer in Europe," said Roelant de Waard, vice president, Marketing, Sales and Service, Ford of Europe. "The other key trend is the desire for a more memorable and personalised ownership experience that is tailored to individuals and respects their time. Vignale will meet these needs in a fresh way," he added.